Firebites are nimble enemies from Donkey Kong Country Returns and Donkey Kong Country Returns 3D. They are relatives of Buzzbites that act in the same manner, moving quickly along platforms, walls, and ceilings. However, they are also drenched in flames and leave long but ephemeral trails of fire behind them. Should the Kongs touch by a Firebite or the flames it leaves behind, they lose a heart from their health meter. The enemies are only found in the level Perilous Passage. They are invulnerable to all of the Kongs' attacks and can only be avoided. 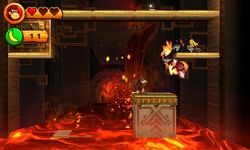 However, one Firebite gets crushed by a falling block during the level. ↑ "Firebites travel along the sides," Knight, Michael. Donkey Kong Country Returns Prima Official Game Guide. Page 164. This page was last edited on February 17, 2019, at 18:21.